~ Cider Antiques ~: Bye Bye Baby ~ growing up so fast ! Bye Bye Baby ~ growing up so fast ! 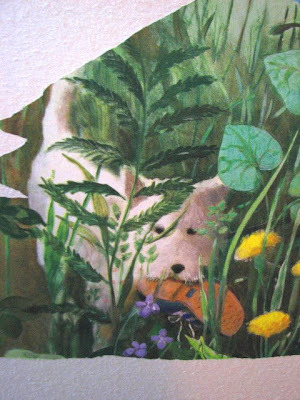 Here is an old picture . . . . a tree house went with the puppy paper. It was pretty cute. The room does look much more grown up now . . . Hockey, Team sports and Trophies. Ah well . . . they can't stay little forever. My daughter has plans for her own room. 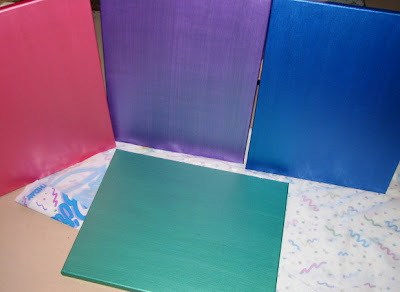 . . 4 canvas frames that have each been painted. We aren't too sure about the green, but we can always change it. She wants to hang them on the wall above the bed (2 over 2). Maybe we should just stick with 2 colours and have them opposite each other. What do you think? The walls are a light mauve. I'm thinking the dark purple and the blue might be enough. Hmmm . . . to be continued next weekend. The room looks great! The Senators stuff is much more "big boy" like. I'm sure the kids will love the rooms. Love it!...Glad he's a hockey fan! I do love the little puppy...so cute. Ya know...I think I like the 3 colours standing...not sure about the green. They really look nice painted...and would look very cool above the bed. It is so hard when you see them growing up and moving on from their "baby" things. My daughter is 12 also, and she is at the stage she wants to redecorate her room every twelve months - her tastes are changing that quickly!! 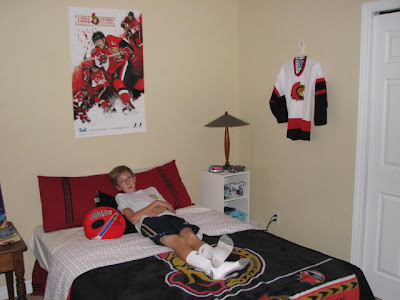 Your son's room does now look very grown up. My Britty currently is in the "funky, groovy, cluttered" stage. I do think she will always be in the "cluttered" stage though!! Yes, how they grow up fast! 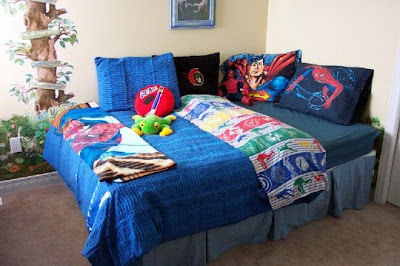 Your Sons room looks great Karen and I am sure he must be very happy with it. Best of luck with your daughters what she decides in the end and I am sure that it will look wonderful. What a darling post! The room looks like a GUY room now! Great idea to keep a piece of the old border. Please stop by and pick up an award I have for you! 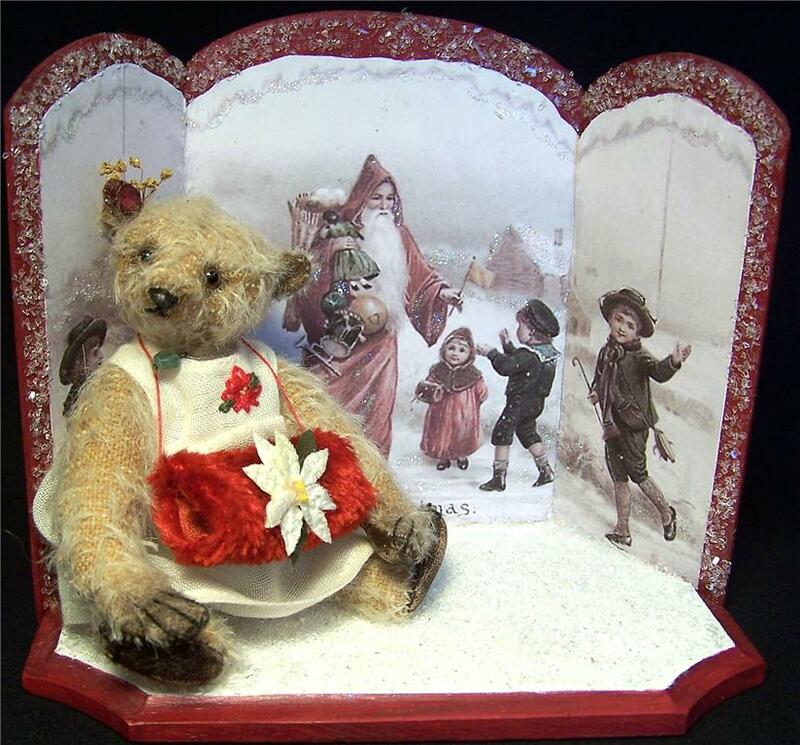 I am a collector and seller of Textiles, Vintage clothing and Collectibles. 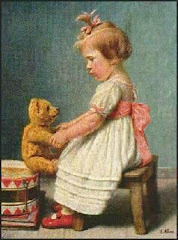 I also repair and restore lace, linens, vintage clothing, antique dolls and teddy bears. Cider ~ as in Apple Cider ~ is our family dog. We think she is a Collie, Husky, German Shepherd mix. She looks a bit like Lassie and has a strong herding instinct like a Collie. She has a curly tail and howls like a Husky. She has very big ears and a fluffy mane like a German Shepherd. She keeps us guessing : ). Preparations ~ Exactly 1 month until the Show!